Thursday September 23rd 1897 Will went to help thresh but the machine broke and he came back before noon. He was busy about the place and I was sewing what spare time I had. I got the butter ready. Friday September 24th 1897 I took an early start to town, delivered the butter, went and got my dress fitted. did some shopping and got over home just as they were at dinner. Mother and I went over to Woolfs but did not find Mary at home. I got some plums. We called at Folsoms. I came home then and it was nearly night. Will was away threshing. Saturday September 25th 1897 Will went to help thresh. I put up tomatoes and made plum butter and after dinner went over to Emmas to help sew. The Stevens girls, Olive & Callie were there. We were making things for the Bird girls. Sunday September 26th 1897 I took Emma Weldie to church with me to [Sand?] town. I got dinner over and went over to Johns awhile. The Bird family were all down. Will and I spent the evening up to Stevens. weather hot and dry. Monday September 27th 1897 Will went to the Coralville Mill and had his dinner at Woolfs. I sewed all day on sleeves I am fixing. 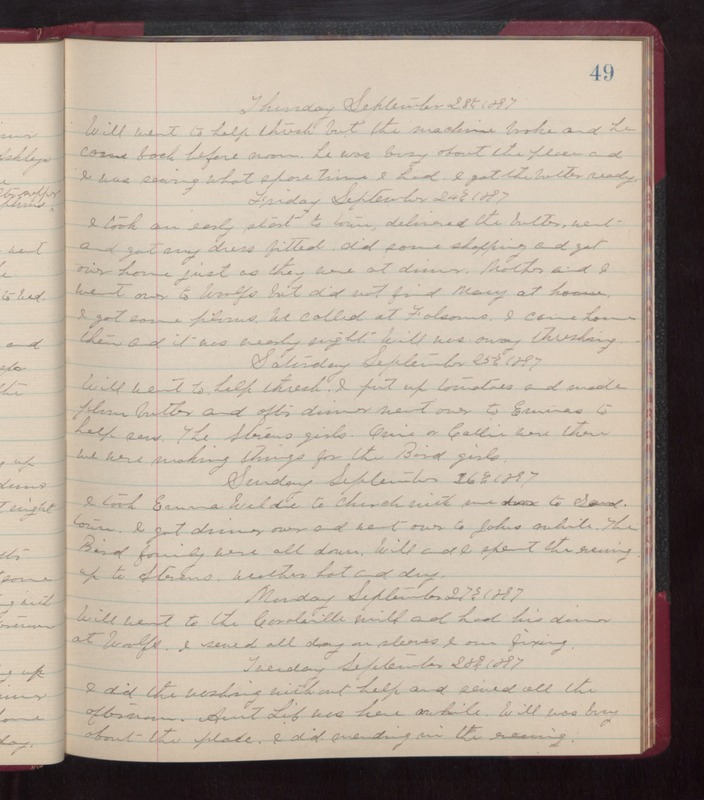 Tuesday September 28th 1897 I did the washing without help and sewed all the afternoon. Aunt Lib was here awhile. will was busy about the place. I did mending in the evening.